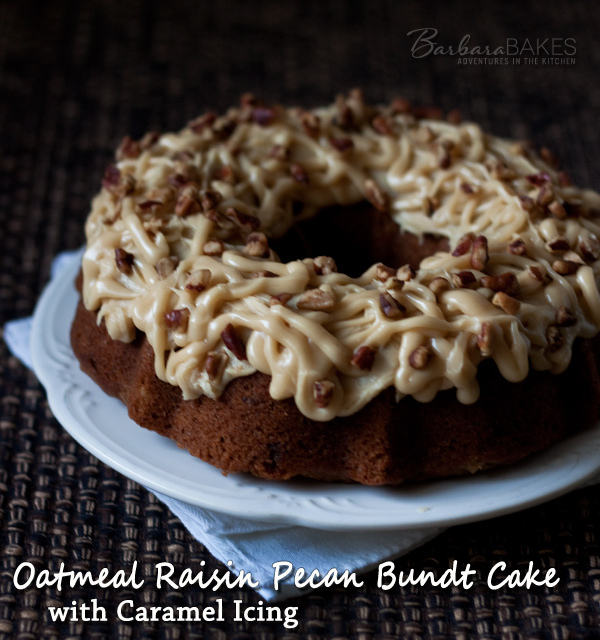 A moist, delicious oatmeal spice cake loaded with raisins and pecans, and topped with a sweet caramel icing and crunchy, toasted pecans. Sort of like a cross between an oatmeal cookie and a carrot cake. Do you save recipes you’ve clipped from magazines? I have a couple of binders and a bin full of them. This recipe is adapted from a recipe I clipped out of a Cooking Light magazine in 1998. I’ve made it several times but when I was thumbing through this month’s Taste of Home magazine and saw the beautiful Chocolate Spice Cake with Caramel Icing dripping down the side, it reminded me how much I liked this Oatmeal Cake. I changed the Cooking Light recipe to use butter instead of shortening, and sour cream instead of buttermilk because I never have buttermilk on hand. I also added raisins and pecans and changed it into a bundt cake. I made two half size bundts because they cook faster, are the perfect size for dessert, and it fits in a Ziploc freezer bag so I can save one cake for another day. With the changes I’ve made, it’s not really a light cake any more, but since it’s got oatmeal in it, you could definitely get away with serving it for breakfast without the icing. It’s a super moist cake, with the texture of a carrot cake. 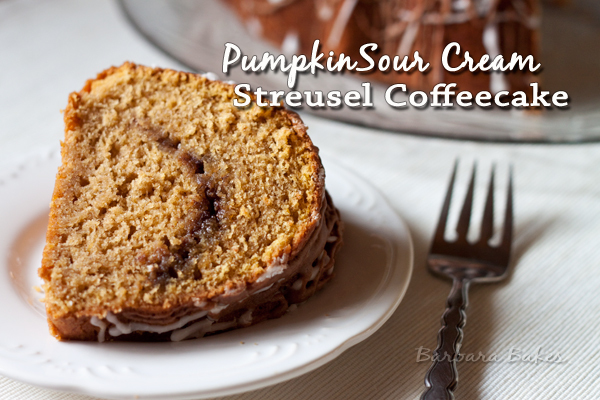 It would be fantastic served in the morning with just a sprinkle of powdered sugar. Toast pecans. Combine boiling water and oats in a medium bowl. Set aside to cool, about 20 minutes. In a medium bowl, whisk together flour, baking soda, cinnamon, salt, and nutmeg. Set aside. In a large mixing bowl, beat granulated sugar, brown sugar, butter, and vanilla at medium speed for 5 minutes. Add eggs, 1 at a time, beating well after each addition. Add oatmeal, beating until blended. Add sour cream and mix on low until blended. Add flour mixture and mix until well combined. Stir in raisins and 3/4 cup chopped pecans. Pour the mixture into the prepared pan(s). Bake half size Bundt for 35 minutes; full size Bundt for 50-60 minutes or until a toothpick comes out clean. Cool in pans 5 minutes on a wire rack. After 5 minutes invert onto wire rack. Let cool completely before making the icing. 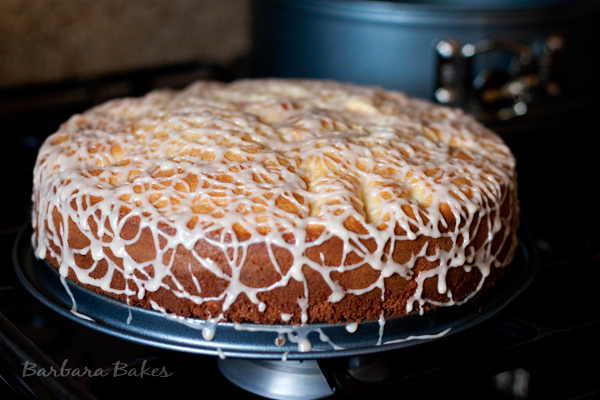 Drizzle the hot icing on top of the cake. Sprinkle with chopped pecans. Store the cake loosely covered in refrigerator. High altitude adjustment: Increase oven to 375º. Reduce granulated and brown sugar to 2/3 cup. Bake for 30 minutes. *To toast pecans: In a small heavy skillet, melt 2 tablespoons butter. Add pecans; cook over medium heat until toasted, about 4 minutes. Set aside to cool. I will be making this cake soon! Hello! Mrs. Barbara. I like to know. Since I’m Diabetic. What can I used to substitute, for real Sugar? Because, this looks very rich, and tastefully decorated . Barbara, this looks very good, im going to make it,thanks!!!! This looks very good. The frosting on the top make me want to devour the screen. Thanks Shobelyn! The frosting really does make the cake extra special. 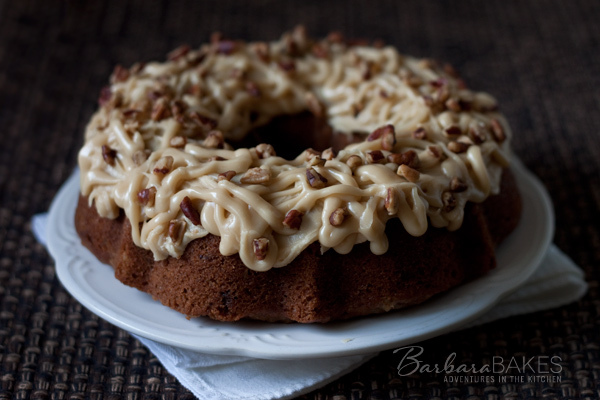 Wow Barbara, this bundt cake topped with gooey caramel looks delicious. Oooohhhh……loving this! I’m so ready for all the warm, fragrant Fall spices. What a lovely recipe to welcome the season. 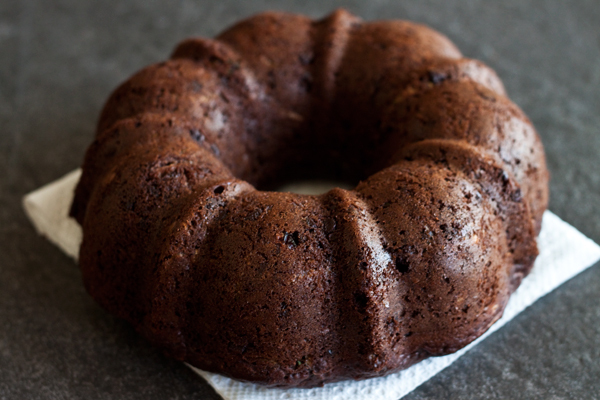 I ♥ Bundt cakes. And these flavors sound awesome! This looks great, Barbara. I love the changes you made and the caramel icing sounds delish. Your pumpkin cakes are making me ready for some cold weather! I love oats in anything, never seen it in a bundt though. Sounds delicious.